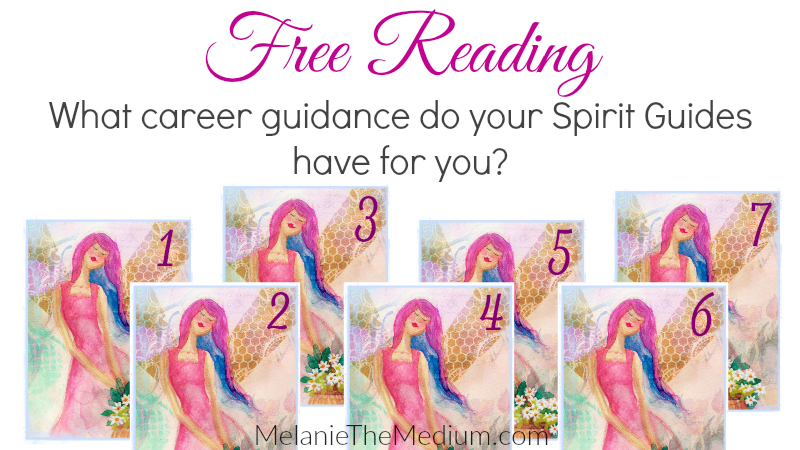 Free Reading: What career guidance do your Spirit Guides have for you? One of the most common reasons people come to me for a reading is for insight into their career. They want a career they love, and sometimes they need a little help figuring out the next step. This free reading will give you a message from your Spirit Guides (your angels and other spiritual helpers) to help lead you to a more joyful career. To get your message, take a few calming breaths, ask to be led to the message you need to hear today, and then pick the card that you feel drawn to. Scroll to read your message. Did you pick card number one? Your Spirit Guides want you to know that although you have a career you enjoy, you go through periods when it feels like a burden. This happens when you temporarily lose the balance balance between work and rest. It is up to you to set boundaries and make time for You. Once you create balance, you will be able to enjoy your work more without feeling like it’s a burden. You’ll also have the energy you need to move forward, faster and with more joy, in all areas of your life. Did you pick card number two? It is time to go in a new direction, and you feel it, but you’re worried that you don’t know what you want to do. Your Spirit Guides say that you are already on your path. You don’t have to worry that you won’t figure out your new direction, because your spirit is leading you forward. Ask yourself, “If I knew I would be successful and everything would work out, what would I do?” Notice what options come to mind and which ones bring you joy when you answer that question. 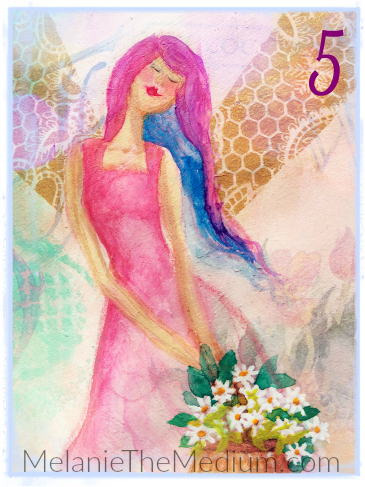 Your spirit already knows the most joyful path and is giving you nudges to move forward. Every day you are getting more clarity, so trust what you feel led to do, release any self-imposed limitations, and know that you are meant to do what brings you the most joy. Following your joy will lead you to the job that will bring you the most success and fulfillment, so trust your joy. Did you pick card number three? You are longing for connection. You want to feel like you are making a difference in other people’s lives, and you want a personal, live connection with others. If your current job involves working alone or staring at your computer all day, find ways to incorporate being with others more, or find a job that allows for that personal connection. That is what will bring you more joy and more peace in your career. Did you pick card number four? You love a career that involves creative expression. You are creative and passionate, and you want to bring that to your work. If you don’t already have an outlet for your creativity, think about ways you can incorporate it into your work. You get so much joy from being creative, and bringing that into your career will make you fall in love with what you do. Did you pick card number five? You are going to be offered a new job soon. You’ve been waiting for this opportunity, and it is already on its way. Keep following any inner guidance you receive about next steps, and know that a new job that you will enjoy is on its way. Did you pick card number six? You are ready to be in a position of leadership and let your voice be heard. Allow yourself to move forward with the vision of success that you know is in your future. Trust your desire for leadership, know that you can do it, and keep moving forward. Did you pick card number seven? What you really want right now is time away from working. Take a vacation, or find a way to make it financially feasible for you to let your job go and spend more time on your own schedule. You want to be at home and with your family. You want freedom and rest. You can have all those things. You are the one to make it happen. Trust that there is a way, and think creatively about how to make your dream a reality. I hope the message you received today helps you get more clarity about your career. You deserve a career you love. You are worthy of it. When you believe that, you will feel empowered to make the changes you want to make to bring more joy into your career and your life. P.S. The artwork for this reading and my other free readings was painted by me! Isn’t this fairy girl sweet?! Free Reading: What’s Holding You Back? Love the message I got – thank you guides I will see on February 5th the outcome of it. You keep my back and I feel guided.